This similarity extends to Te Hera where the same family that makes the wine grows the grapes. John Douglas, winemaker and vigneron, was the first to establish himself on Te Muna Road and now other big names have followed. Here the grapes ripen slow and long - and this is where the complexity and savouriness comes from. Some would call John a fanatic when it comes to making his Estate Pinot. 'Every berry is sacred' at harvest time and it's all hands on deck to ensure only pristine, perfectly ripened grapes go into his wine! The results show in his gloriously complex Pinots. The Estate and Kiritea both come from the same vineyard. The Estate however gets the 'cream of the crop' and premium oak treatment. The Kiritea, however, seriously over-delivers when price is put into consideration. An awesome 2nd label! 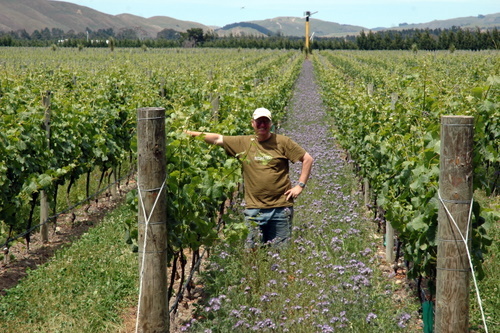 Picture Left: Taken in 2005, John standing in beautiful Organic Te Hera vineyard.